I am still in cloud nine these days because last February 5, I ran my first half marathon! We started at the Alabang tunnel, went up the skyway to Sucat, then to Bicutan, then u-turn at the speed limit signage just before the C5, and then back to Alabang. Yes, that was 21 kilometers. Whew! Since this was the country’s first midnight marathon, the full marathoners started at midnight. Duh! :)) Then the 21 km runners were next. We started at 3:30 in the morning. My goal for that run was to finish…and to finish injury-free. There were 13,000 runners that day. 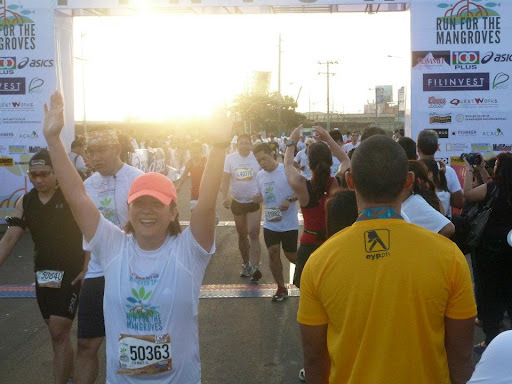 Each runner donated 3 mangroves for the mangrove forest in Mindanao. Running the skyway was challenging. To distract me from pain, I watched the other runners and hoped to see somebody I knew. I saw some celebrities and then one by one I saw my siblings. Ah, the finish line. And after running 21 kilometers, crossing it was life-changing…and all for the better! I congratulate myself and all the other finishers for conquering the skyway. Woohoo! We did it!